Keshet, which means rainbow in Hebrew – has been my rainbow for the last 30+ years. 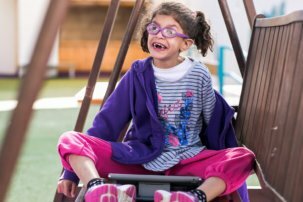 My name is Abbie Weisberg and I am the CEO of Keshet – [offering people with] special needs extraordinary opportunities. I often ask myself what life would have been like without the children, adults, families and staff here at Keshet? I simply cannot imagine this scenario, and feel lucky to have crossed paths with Keshet. My journey began when I attended a Keshet banquet in 1990 when I was pregnant with my first daughter. I remember listening to a father share his story about how he knew something was “not quite right” with his baby daughter. I felt the palpable love in the room, mixed with warmth and magic. Right then, I knew that I had to be connected with Keshet. At that time, my connection was not as a significant donor; instead, I asked: What hands-on contribution could I make to help? 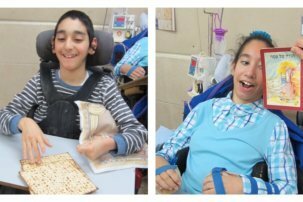 I began teaching in Keshet’s Sunday School, where I led a classroom of 8-10 students with developmental disabilities. Sunday School technically included Jewish Learning. Having been raised as “one of those Jews” who went to shul only on High Holidays, I knew I had a lot to learn. Keshet sent me on mypersonal path of Jewish learning and living. My life became centered around being Jewish and I loved it. I learned as I taught. Eventually, we sent our three daughters to Jewish Day School. Our Keshet Day School was housed together with the Solomon Schechter and Ida Crown High School. Basically, my family grew up with Keshet. Talk about B’Shert– it was meant to be! Keshet is unique in that we provide inclusive, quality, innovative programming year-round. Our theme for this year’s banquet is 24/7/365. We have grown organically. As our students have grown, so have our programs. We now offer Day Schools; Sunday Schools; camps (both day and overnight); Adult Programming; and as of late, Residential Programming, and we take pride in our high staff ratios. Keshet is a family; and as a family we are deeply connected not only with our individuals with special needs but with their families and loved ones, including siblings, grandparents, aunts uncles, and friends. In fact, this past weekend, one of our young adults was at a friend’s wedding in Boca Raton, Florida. Included is a picture that is worth a 1000-in-three words: This is Keshet. Our secrets to success are honesty, transparency, and – most of all – selecting and surrounding ourselves with the very best team. I wish I could say I can do it all, but I cannot do it all! I am now in my mid-50’s and hope to continue on for many years (though I myself have a little health challenge). I have a stellar team that makes it work. With Keshet, my life has perspective and meaning, and I am never short for a hug or smile. I carry Keshet with me everywhere I go. I am thankful for every person who works at Keshet and thankful for our Board of Directors and Board of Trustees who work tirelessly to make our corner of the world in the Windy City a better place. Emunah is fundamental to life: In what do we have faith and trust that enables us to go about our day and do the work that we do? 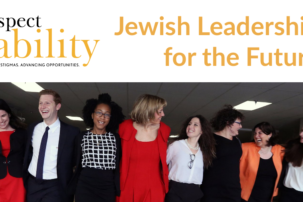 Emunah is fundamental to relationships: How do we create trust in our daily relationships?Emunah is fundamental to creating solid ground: How do we create a trustworthy environment for the people we lead? Each day do at least one thing that will reinforce your trustworthiness – your Emunah – with the people you lead and serve. What is that one thing you will do daily this week to convey your trustworthiness? Thank you, and Shabbat Shalom! Abbie Weisberg is the CEO and Executive Director of Keshet, an organization that serves over 1000 people with disabilities in the Chicago area while consulting with dozens of social service agencies around the country. Ms. Weisberg has been with Keshet for nearly 30 years and has worked as a teacher, program director, and now as the organization’s leader. Ms. Weisberg holds a Master’s Degree in Not for Profit Management from the Spertus Institute for Jewish Learning and Leadership and has made Keshet a family affair as her husband, three daughters and dog Meeko all volunteer for the organization.